I am willing to suspend reality and go with the Saigon alleyway vibe they're going for here, but the service is too good, the drinks and desserts too polished, and the place too spotless to make me think I'm hearing the buzz of Honda scooters. Actually I'm not sure how many noodle shops in Saigon serve traditional Vietnamese blend coffee roasted in Australia, and San Pell, have colourful plastic place settings for children, and baskets under the squat stools for bags or coats, but I am pretty sure they're less likely to have as many Maseratis and BMW station wagons in the car park than this new inner-city shopping village has. On the Epsom Road edge of the village, Hem 27 specialises in Vietnamese noodle soups from various regions, and serves a tidy number of hawker snacks and rice dishes, plus coleslaw and rice-noodle salads. It's a long, but well-ordered menu (chunked into types) that denotes whether a dish is veg, gluten free, contains nuts or is spicy. 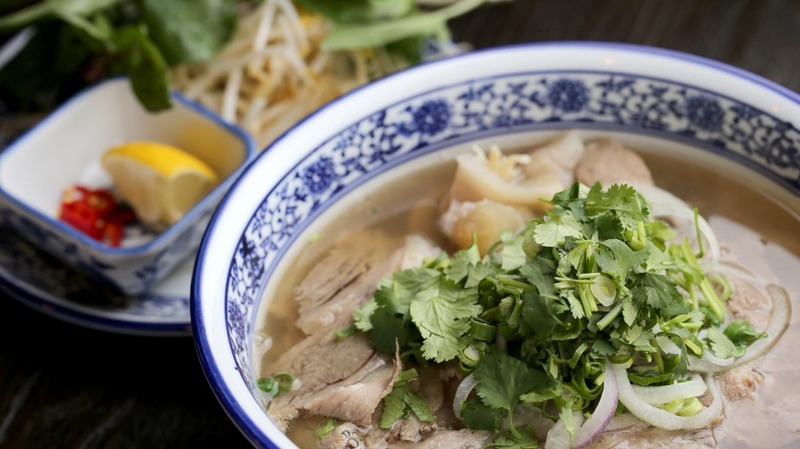 It's purely Vietnamese, without Chinese dishes, and has some unexpected, out-of-the-hat dishes. Since it's winter I can only see hot food, and since I'm only human, I can't see past the fried snacks. 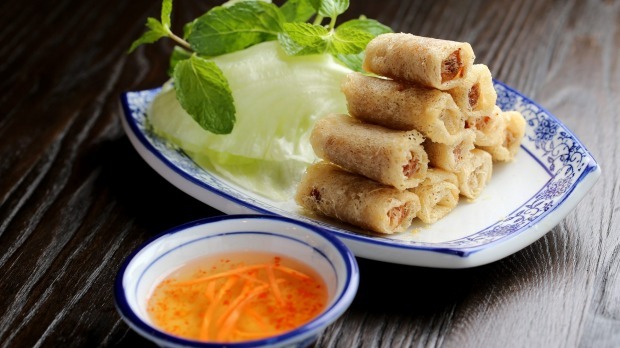 There is superior crunch in the fine cross-hatched net-skin spring rolls, filled with a slightly peppery shrimp and crab mince; and the crisp whole chicken wings are lovely and tender on the inside. The soups list has more to show than just pho, though the famous beef and slippery rice-noodle soup is here in all its fragrant glory, with six different toppings including rare beef slices, brisket and tendon, and shredded chicken. Other soups include glass noodles in a light chicken broth, vermicelli noodles in coconut curry broth, rice noodles in spicy beef broth, and egg noodle soups in pork broth, with trimmings. Among the specials is a thick tapioca noodle soup with soft-shell crab that made the owner's mother famous in Springvale, apparently, when she introduced it to the menu of a restaurant there. It's a busy bowl of chewy noodles, with a whole fried crab, slices of pork loaf and lots of spongy pieces of fish cake bobbing in a bright, slightly tangy, burnt-orange coloured gravy. I'm sure that condensed milk must have high-inducing qualities like red cordial, especially when served with bitter robusta-blend drip-filtered coffee. I am way more into it than I should be. You could also take your coffee poured over a sweet freestanding custard pudding, or find sweetness in a fruit smoothie. The shutters along one wall at Hem 27, the candid black-and-white photos and dark-stained wood are signs of Saigon, and are much more comfy than a stark white-tiled room with laminate tables. I'll go with this referential kind of reality. 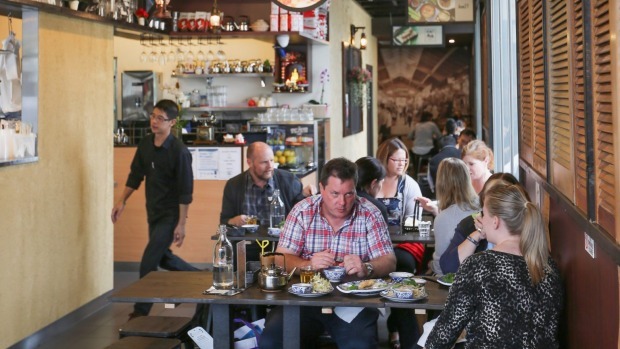 Don't … Be too precious about personal space at the communal tables.